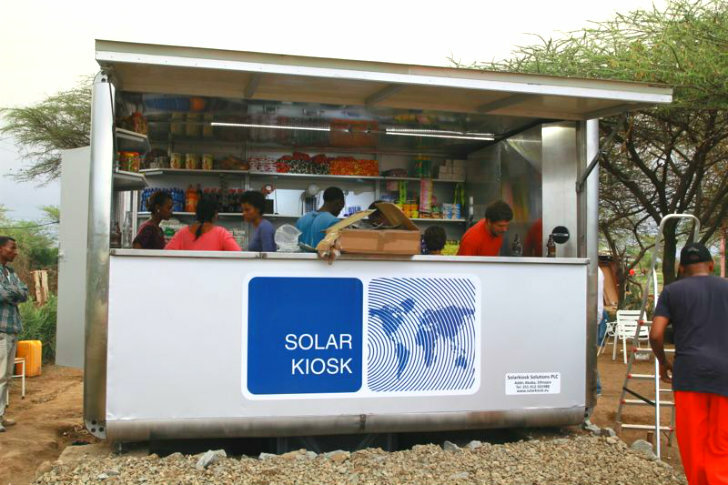 The world's first solar-powered kiosk is now open for business in Lake Langano, Ethiopia. Topped with photovoltaic panels, the lightweight modular unit sells a variety of goods to local villagers, provides power for battery charging, and stays open with the lights on at night. SOLARKIOSK was designed by GRAFT Architects and is now its own company based in Germany. These modular, off-grid buildings will help developing countries leapfrog over traditional electric grids towards renewable energy generation and along the way help grow the local economy through sustainable businesses. Demand for electricity in developing countries is on the rise, but without a reliable electric grid or even access to power, other solutions have to be developed. Luckily, developing countries can now leapfrog the traditional grid and head straight for off-grid renewable power solutions like the SOLARKIOSK. The first one to be up and running is located in Ethiopia, and it provides solar battery charging and a variety of goods. The lights come on at dusk and provide safe and sustainable lighting during the night for business, reading and other activities. Other kiosks have been deployed and are expected to be up and running soon in other off-grid locations. GRAFT Architects designed the autonomous business units using a kit that can be customized according to an area’s needs. Different sized units provide for different business or power needs and modules can be grouped together to create even larger systems. The solar panels will be manufactured centrally to control quality, but the modules themselves can be fabricated locally using materials akin to the region. After fabrication, the parts are flat-packed and shipped by whatever means is available — truck or even a donkey and a cart. Upon arrival, the units are easily assembled and ready for business quickly. Each kiosk will be staffed with local residents after proper training on how to run the solar systems and run a sustainable business. What I want to know is whether you have a regional office in West Africa? It is exciting to see solar used in this way. Rural communities in the poorer parts of Africa need these solutions and I'm really interested in these empowerment ideas. We have a company in Somaliland and are working os Solar solutions as well for all sectors. I think your company has a brilliant idea, but what about cost. Is this feasible in a low income generating economy? I would love to know more about this unit and the modular system to see if we can get this in more places. Keep up the good work! Very cool! It gives credence to our Companies belief in fit-for-purpose rural solutions. Please also have a look at www.rvesol.com/kudura for more about our solution - similar but different. Kudura provides community level potable water, electricity in the home, biogas for cooking and biofertiliser for rejuvenating over-tilled lands. Luckily, developing countries can now leapfrog the traditional grid and head straight for off-grid renewable power solutions like the SOLARKIOSK. 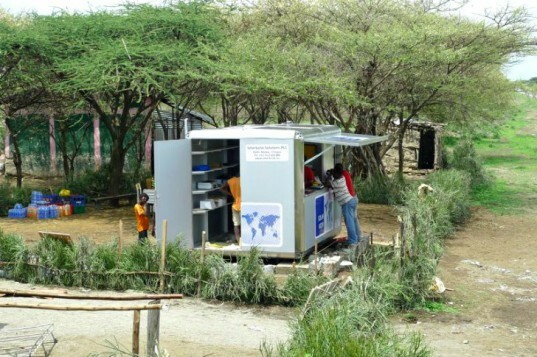 The first one to be up and running is located in Ethiopia and provides solar battery charging and a variety of goods. The lights come on at dusk and provide safe and sustainable lighting during the night for business, reading and other activities. Other kiosks have been deployed and are expected to be up and running soon in other off-grid locations. GRAFT Architects designed the autonomous business units using a kit of parts system that can be customized according to an area's needs. Different sized units provide for different business or power needs and modules can be grouped together to create even larger systems. The solar panels will be manufactured centrally to control quality, but the modules themselves can be fabricated locally using materials akin to the region. After fabrication, the parts are flat-packed and shipped by whatever means is available - truck or even a donkey and a cart. Upon arrival, the units are easily assembled and ready for business quickly. Each kiosk will be staffed with local residents after proper training on how to run the solar systems and run a sustainable business. Installing the solar panels and stocking the new kiosk with supplies and items for sale. Assembly of the SolarKiosk almost complete.